“The Round Rock Independent School District’s Board of Trustees, at a meeting on January 24, 2019, took action on two matters to provide specificity to rules already in effect regarding authority to speak on behalf of the Board or the District. Because these actions have been interpreted by some as a violation of Trustees’ First Amendment rights, we thought it necessary to clarify. 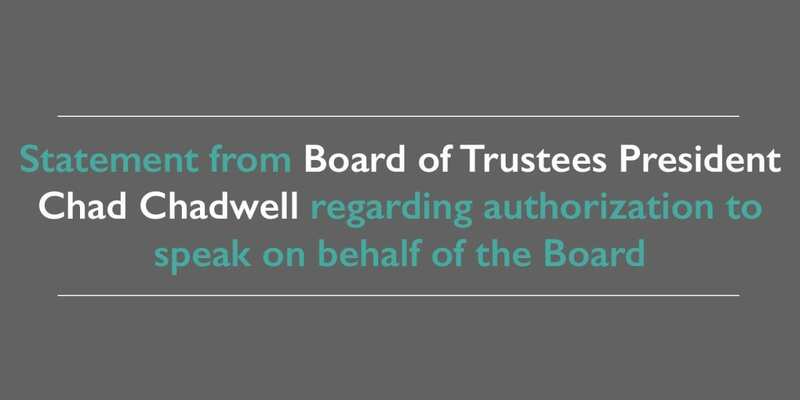 “The motions approved last week do not prohibit individual Trustees from speaking to members of the media or legislators when speaking for himself or herself and, in fact, do not include any substantive changes to rules already in existence. Board Policy GBBA (Local) and Board Operating Procedures already permitted the Board to designate a spokesperson when speaking for the Board as a whole or the District. I move to designate the President as our Board’s spokesperson with the media, and if the President is unavailable, the Vice President is hereby so designated, and if the Vice President is unavailable, the Secretary is hereby so designated, or someone designated by the Board in policy and Board operating procedures. I move that all Board advocacy and communication with the Legislature on behalf of the District be coordinated with direction of the District’s Legislative consultant.